Teenagers from London's black community are being targeted by a new Metropolitan Police advertisement. The advert from Operation Trident, which fights gun crime in the community, portrays the views of young prisoners jailed for gun offences. The campaign titled "Don't Blow Your Life Away" will run for four weeks and will be aired on radio and TV channels. 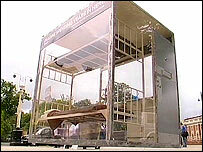 A replica prison cell will also be on tour in five boroughs where gun crime is prevalent. Researchers spoke to prisoners who were serving time for murder, attempted murder and for carrying firearms. The replica cell which has glass walls, contains bunk-beds, a steel toilet and washbasin. The campaign will focus on youths in Southwark, Lambeth, Brent, Hackney and Haringey. Detective Chief Superintendent Helen Ball, head of Trident, said: "We have designed this year's campaign to encourage young people to think about what really matters to them and what they would not be able to do, or have, if they ended up in a prison cell. "Trident is concerned that people are starting to carry guns from an increasingly young age. That is why this campaign is aimed at 13 to 19-year-olds in London, especially those living in gun crime hotspots." Lee Jasper, chair of the Trident Independent Advisory Group, said: "The message from London's black communities is clear and simple. We say: Stop the violence." Since the beginning of this year, Trident officers have arrested 50 teenagers over serious gun offences, police figures showed.